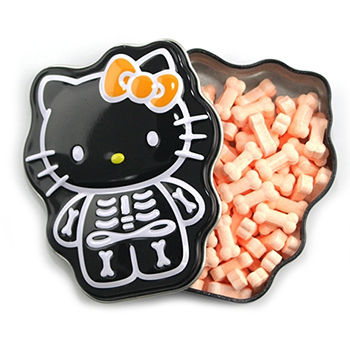 Pucker up while eating Hello Kitty skelly bones. These orange-flavored bone-shaped candy are intensely sour. They come in a cute Hello Kitty tin, making it a great collectable for Hello Kitty fanatics. Dextrose, maltodextrin, citric acid, magnesium stearate, artificial flavors, and artificial color FD&C yellow #6.